Everyone knows that staying hydrated on the go is important, but luke warm water can be a drag. Whether you’re camping, backpacking, or even just out for a hike, sometimes you want the luxury of hot coffee or ice cold lemonade. We’ll go over eight of the best thermos options for keeping your hot drinks hot and your cold drinks cold out on the trail. Before jumping into buying your new thermos, there are a few options to consider. Below are five of the most important specs to look at and some tips on how to make the best choice for you! Material always matters for gear, but especially when you’re going to be drinking out of it. Typically, beverage containers are made out of plastic, glass, or metal. Glass is great for home – easy to clean and sturdy, but a nightmare if it breaks in your pack. For camping, we tend to rely on plastics and metals, and there are a few things to keep in mind when choosing which one you want to use. There are several types of plastics used in thermoses, and you can even buy some products that only utilize plastic. However, many of these options have poor heat and cold keeping times and contain chemicals that can be hazardous to your health. While many of the products below use some plastic, all of them are BPA free. Metal offers good insulation, sturdiness, and durability, but similarly can have some drawbacks for your health. Some types of metals rust more easily or can be bad for your body, so it’s important to check that your thermos is made from a bio friendly material like stainless steel. This is perhaps the most common consideration in buying a thermos. Heat keeping time refers to the amount of time that your bottle will keep your beverage hot, and surprisingly, it can vary a lot. When looking for your ideal purchase, make sure you consider just how hot you need your drink to be, as extra insulation often means extra weight. For car camping, fishing trips, and short hikes, a little extra weight may be worth it for piping hot coffee 12-24 hours after you leave the comforts of home. However, if you’re backpacking, a hot drink may not be as much of a luxury if you break your back carrying it in. In this case, 6-10 hours may get you your after dinner cup of cocoa without too much extra effort. Just like heat, cold keeping time refers to how long your thermos will keep a drink cold. And, just like heat, this number varies quite a bit! Some thermoses claim to keep iced drinks cold for several days, while others just keep them from warming up in the sun. Make sure to consider the environment you’ll be using your bottle in extreme heat may make sense for a better cold time than a breezy mountain pass. Another thing to consider along with the cold keeping time is how well your thermos keeps cold liquids inside the bottle. While most well built products won’t leak, a cold drink in a warm environment means condensation build up, which can leave your pack, camp chair, or table drenched if not wiped off regularly. If you want to stay dry, make sure you look for a condensation or sweat free product. If you’re tubing down a river or fishing on the lake, this may not be as important. This consideration is more of a preference than an indication of quality, but it’s important nonetheless. Thermoses come in a range of sizes, and just the products below vary from 12 ounces to 2 quarts. While the “two liters a day” rule is always good to follow, you don’t necessarily have to fit all two liters of your hydration in your thermos. For solo hikers, self sufficient campers, and people with sharing problems, a small thermos is likely all you need – you probably shouldn’t drink two quarts of coffee. If you’re going to an area that’s especially hot or dry, consider upsizing, but for one individual 16-24 oz is generally an adequate size. If you’re bringing enough of your beverage for the whole crew, load up with one of the bigger options. The last thing to consider in buying your thermos is what style you need. Most people looking for a thermos are content with the traditional design – a bottle with a stopper and a screw on lid. Most people, however, don’t know that you have options! Traditional thermos caps are great for lazy campfires or trail breaks when you have your hands free and a place to sit down. They start to fall flat when you want to drink while mobile or keep your dishes to a minimum, and that’s where some of the alternatives come in. Several thermoses feature wide mouth designs with vacuum sealed lids that allow for drinking like a regular bottle without losing the same amount of heat or cold. Others feature push buttons, permanent straws, or valves that make one handed (or, for the talented, no handed) hydration easy and convenient. If you plan to use your thermos on the go, such as backpacking, hiking, or running, these options might be for you. Now that we’ve gone over some of the things to consider in buying a thermos, let’s get into the details! Looking for a classic, fail safe thermos that’s guaranteed to keep stick around? Look no further than the Stanley Classic Vacuum Bottle. These bottles come in sizes from 16 oz all the way up to 2 QT and feature vacuum insulation technology that keeps your drink at just the right temperature for 24 hours, cold or hot. Even better, these thermoses can keep iced drinks cold for 120 hours – that’s five days! Each size of bottle features a screw top lid that doubles as an 8 oz cup and a classic pour through thermos stopper. These thermoses are a high quality (but affordable) option for those who want a more traditional style thermos. Unlike many other traditional options, however, this bottle is BPA free and comes with a lifetime warranty. For car camping, fishing trips, or short hikes where you don’t need to drink on the go, this is a great option. However, if you’re looking to slim down your pack weight or hydrate on the move, you may want to opt for another one of these top rated products. 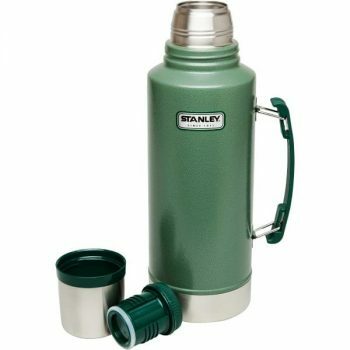 Related: If you’re a fan of the brand but need a more movement friendly container for your beverage, check out the Stanley Classic One Hand Vacuum Mug. This insulated mug uses a push button top that allows for single hand drinking and pouring – but without quite the heat/cold keeping capacity of the traditional thermos. Unlike the classic Stanley thermoses, the Hill Hiking Double Walled Water Bottle breaks from tradition and sets itself apart from the crowd. This bottle features a sleek, attractive design in a variety of colors, all BPA free stainless steel. While this thermos does not use the standard pour through stopper, it has a wide mouth design that allows for easy sippage, plenty of space for ice cubes, and convenient water filtering on the trail. It also comes with a tea/fruit infuser that allows for easy use and extraction of bagged or loose leaf tea. This little thermos is a well designed bottle for hikers and backpackers alike. While it doesn’t have as big of a capacity or as long of a heat keeping time as some of the other products here, this is a great option for those who need a lightweight and sleek way to store their beverage on the go. The Fijoo Stainless Steel Thermos Bottle is yet another great option for those who desire a classic thermos. This product features 18/8 stainless steel with a BPA free plastic thermos top and screw on lid that acts as a cup. Using vacuum insulation, this thermos will keep your cold drinks cold for up to 24 hours, but hot for only 8. 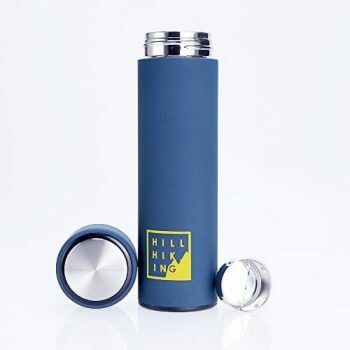 The slim design and leak proof lid makes this a good option for those who want to take their thermos backpacking or day hiking. Additionally, this bottle is dishwasher safe for easy washing when you return. If capacity is what you’re looking for, look no further than the Thermos Vacuum Insulated Bottle. This massive thermos holds 61 oz and boasts a full 24 hour heat keeping time. Like any traditional thermos, the Insulated Beverage Bottle comes with a cap that doubles as a cup and uses a pour through stopper. Some unique features to this product include the detachable shoulder strap and the condensation free double wall design. Although there are many perks to this thermos, it’s hefty size means heft weight almost three pounds making this a bottle best suited to car camping. Related: If you want the quality of this 61 oz bottle without all 61 of the ounces, check out the Thermos Compact Beverage Bottle. This is the same vacuum insulated design in a smaller, 25 oz size. 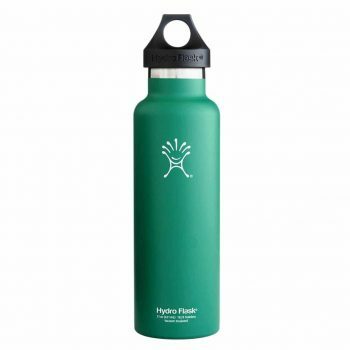 Another great non traditional option for keeping your drinks at the right temperature comes in the Hydro Flask Vacuum Insulated Water Bottle. These bottles come a variety of sizes (from 12 to 24 oz) and an even wider variety of colors. Featuring a screw on loop top lid, these bottles function like any water bottle for hiking, backpacking, and running, but the double wall design gives them an added edge. While this product doesn’t boast a lengthy heat keeping time (only six hours), it does keep your beverage cold for 24 hours, and the powder coat exterior means no condensation pooling in your backpack. This is a great option for campers on the go! Related: If you want even more convenience with your bottle, you might want to invest in a Hydro Flask Water Bottle Cap. This additional cap designed for Hydro Flask bottles allows drinking on the move for an even easier experience. 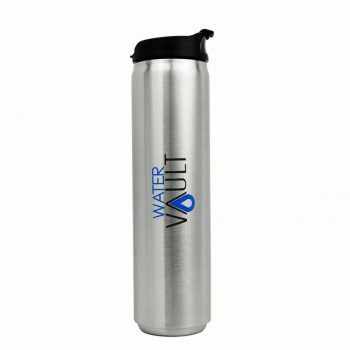 The Water Vault Travel Mug/Thermos is a compact thermos designed to fit in a cup holder or your pack. It features a snap lid for easy hydration but remains condensation free. This bottle is both BPA and phthalate free and comes with a one year warranty. While a great bottle for car camping and casual hiking, the flip top design is not ideal for long days in a backpack where it may pop open by accident. For those buyers looking for a product to accompany them on the more lazy adventures, Water Vault offers a simple and affordable option. Related: Water Vault also sells an accompanying Deluxe Neoprene Bottle Holder with its beverage containers. This bottle holder comes with an adjustable shoulder strap and comes in various colors for stylish ease of carrying. Looking for the perfect combination of durability, quality material, and insulation? 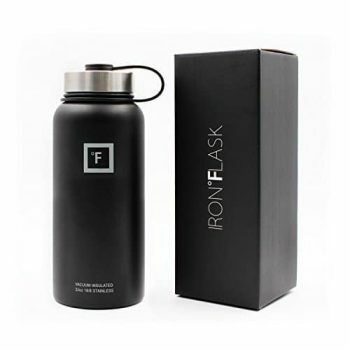 Iron Flask Vacuum Insulated Thermos has you covered. This thermos has a sleek appearance and even sleeker features. With a powder coat to prevent condensation and a double wall design to keep your drinks hot for 12 hours and cold for 24, this is a fantastic option for those who want an all around quality product. While it may not keep temperatures the same for as long as some other thermoses, it does utilize a wide mouth screw top for easy accessibility on the move. This thermos comes with a 100% satisfaction guarantee, making it not only a quality option, but a worthwhile one despite its higher price range. 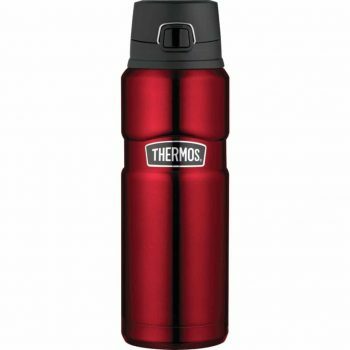 While on the heavy side for heavy duty backpacking, this thermos is an ideal companion for car camping or casual trips. 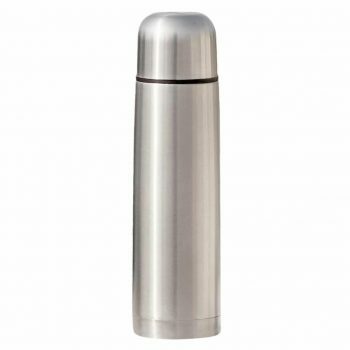 The Thermos Stainless King Drink Bottle is like the slightly smaller cousin of the Thermos Vacuum Insulated Beverage Bottle. The same brand carries the same quality and the same design features, including double wall insulation and sweat proof exterior. This product is much smaller, holding only 24 oz, but still comes up high in the capacity game. In addition to these standard features, this bottle utilizes a push button lid that can be operated quickly and easily while preventing leaks all day. This thermos keeps drinks hot for up to 18 hours, and cold for 24, making it a good choice for those who prioritize beverage temperature. Additionally, it’s dishwasher safe for easy cleaning. Once again, better insulation means heavier weight, but that’s hardly a drag for this all around high quality product. Related: You’re already keeping your drinks warm, why not your food, too? Check out the Thermos Stainless King Food Jar – a 24 oz vacuum insulated food storage container that comes complete with a bowl. With a wider mouth, this container is ideal for eating a hot meal from after a long day, and it’s also dishwasher safe! And there you have it: the best thermos bottle options out there. This article has prepped you with everything you need to know about buying your next thermos, from the material to the design. These eight products should help you find the perfect thermos for wherever you decide to go next! Got any tips on picking the right thermos? Let us know in the comments!